NHS Highland has appointed Arlene Johnstone as the health boards first head of service for learning disabilities and autism. 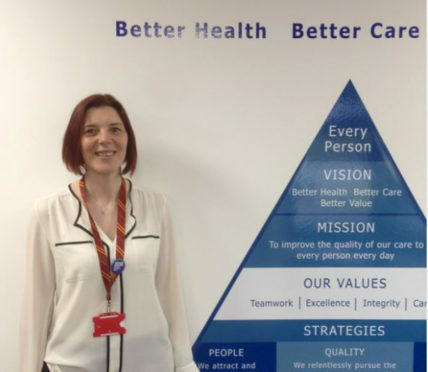 A woman who has spent 20 years helping disabled people has been appointed in a new role created by NHS Highland to ensure that they lead fulfilling lives. Arlene Johnstone has been named as the health board’s first head of services for learning disabilities and autism. Senior figures praised Mrs Johnstone’s “passion”, and her drive to come up with new ideas to inspire those suffering with disabilities in the north, as they congratulated her on the appointment. As a qualified occupational therapist, Mrs Johnstone has been working with adults living with learning disabilities in a variety of settings over the last 20 years. She said she is now keen to explore “creative” ways of ensuring disabled people are able to lead rewarding lives. Mrs Johnstone said: “I am delighted that NHS Highland has decided to invest in this role, and the chance to lead a service and work with other organisations to improve the quality of life for people with a learning disability is very exciting. “I will work with communities to increase the opportunities that are available through existing networks of support such as families, friends or local clubs. After earning her qualifications, Mrs Johnstone worked in a day centre in Midlothian before moving to the Highlands. She was an original member of the Craig Phadrig resettlement team, moving people from the hospital into their own homes. The health worker then moved onto the role of case planning manager, enabling people with complex support needs can continue to live in their own communities. Disability charity Leonard Cheshire strives to help people live, learn and work as independently as they choose by opening doors to opportunities within their local area. Freda Murray, service manager at the Cheshire House centre in Inverness, said she looks forward to working alongside the newly formed service. She added: “We see this as being really positive, it will make a huge difference to families. Mrs Johnstone added: “I also want to ensure all of our own NHS and social care services are accessible to all and I will work with my colleagues to achieve this. “This might include changing environments to ensure they are autism friendly, or providing additional communication training to staff that work in GP practices or hospitals.